Magnetic Rocks 60mLYour favorite fizzing candy with sweet and sour tangy deliciousness bundled toget.. Magnetic Dust 60mLA flavor-packed, sweet sugary powder candy that gives you a unique burst of flavor.. 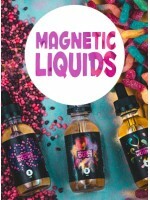 Magnetic Worm 60mLA chewy sweet and sour gummy candy coated with sugary sweetness in one awesome fla..